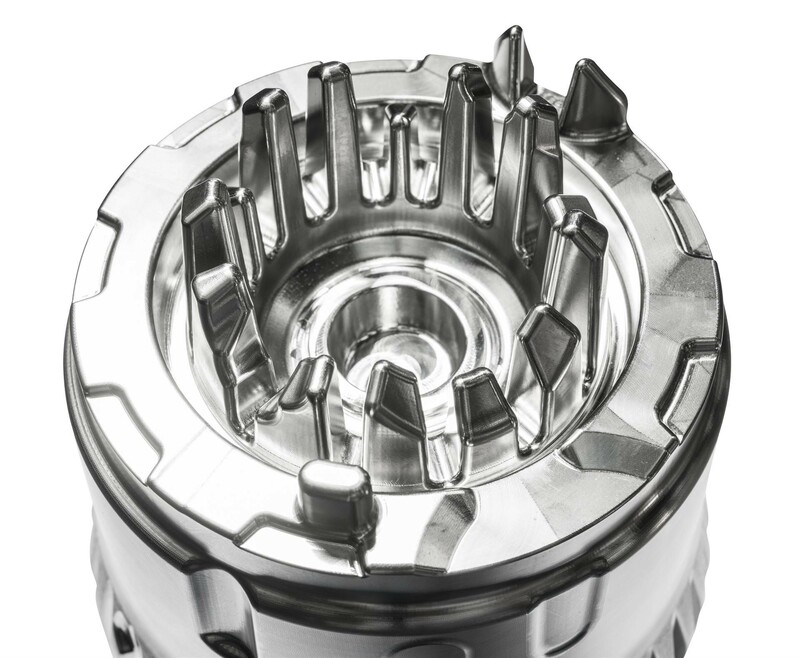 HETEC’s claim of “Performance is not a matter of chance” exactly expresses the philosophy and strategy of the machining services supplier from Breidenbach. And that philosophy was born out of Friedhelm Herhaus‘ experience: For too long he felt hampered in his desire to put his specialist knowledge and skill to practical use and to the customer’s benefit. In such cases there is only one way forward: setting up one’s own operation. Together with his brother Günter Herhaus, he founded HETEC OHG, originally in Bad Laasphe. As the scope of the business grew, brother Werner Herhaus joined the company as well, and in 2000 the next milestone was reached with the founding of HETEC GmbH. That meant anything but standstill, however, and in rapid succession the company invested in CAD/CAM systems (3-axis) and, in 2002, in the first five-axis machining centre as well as the associated data processing and organizational environment. In 2003, a new production hall focusing on large part machining was built at the present company headquarters in Breidenbach. Each shouldering executive responsibility for specific business areas, the three brothers systematically invested in more CAD/CAM systems, CNC machine tools, workflow optimization and remote monitoring of processes. This put them into a position to provide their growing customer base with state-of-the-art manufacturing technology for highly demanding, complex tool and mould construction components as well as large scale basic tools at all times. 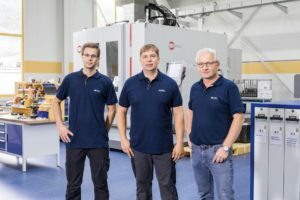 In order to meet the exacting and ever increasing customer requirements with sustainable reliability, HETEC has included five-axis machining centres from Maschinenfabrik Berthold Hermle AG in its machine park since 2009.This began with a C40 machining centre that was followed by a C 30 U and – as soon as they became available – the first large machines of the C 60 U and C 50 U series. In the course of time, a C 400 U was purchased for machining smaller items, and more recently by another large machine, a C 52 U. As a practical and graphic illustration of this, he pointed out that to date the C 40 U machining centre purchased in 2009 has already clocked up over 30000 spindle running hours – and it is still using the original spindle! Not to mention the fact that the precision values recorded in a measurement log from 2016 simply repeated those that had been recorded seven years previously! It is worth mentioning that, despite the broad range of applications in the areas of full processing and finishing work, the Hermle machining centres are ‘only’ equipped with the standard tool magazines. The plausible reason for this is that HETEC has developed its own tool/magazine management system that allows all the milling machines and machining centres (each of which has the same HSK-A63 tool holding fixture, by the way) to be tooled according to the order and the work to be done. Altogether this involves around 2000 ‘sharp’ tools, each provided with a chip, including around 250 different milling tools and around 300 for drilling and thread cutting. This means that the tools can be changed ‘blind’, i.e. deployed as required and with drastically reduced changing and equipping times. With the purchase of the new C 52 U five-axis machining centre, HETEC went another step further by ordering the HIMS (‘Hermle Information Monitoring Software’) base package for the first time. HIMS provides a display of the life status and transmission of the information by email as required. This fits perfectly to HETEC’s manufacturing and (remote) monitoring strategy: single-shift normal operation and otherwise (monitored) automatic operation. With a working range of X = 1000, Y = 1100, Z = 750 mm and the 700 mm swivelling rotary table with a load-bearing capacity of 2000 kg, the C 52 U machining centre is ideally suited to full/finishing machining of extremely intricate tool and mould components or base plates. In conclusion, Friedhelm Herhaus was full of praise regarding the teamwork with Hermle, remarking amongst other things that: “Despite their increasing complexity, the Hermle machining centres can be set up very simply, commissioned quickly and they are operator friendly. The good accessibility also enables us to carry out a full redeployment on the large machines from one workpiece to the next within 15 minutes. This means that even without further automation, we achieve spindle running times of 400 hours per month and machine as a single-part manufacturer. Another example of Hermle’s performance capabilities can be seen in the C 52 U five-axis machining centre project, which we needed very quickly to satisfy urgent customer requirements. We received our order on condition that capacity for 8 x 140 hours of manufacturing performance should be available on schedule. With Hermle’s help, we managed to set up and commission the C 52 U in a short space of time, and to meet the availability requirements not just temporarily, but in the long term as well.